The UK grime scene continues to grow and while the legions of fans await the new Stormzy album, a rapper even more forthright about his Christian faith, West London's Feed'Em, is pulling in more supporters with every release and performance. Getting plays on the BBC and being booked for more and more fests, Feed'Em's latest hard-hitting EP 'Murder The Flesh' is a pointer to a possible mainstream breakthrough for this passionate deliverer of spiritual truth. Born in the Democratic Republic of Congo as plain old Tracy Lenga, the artist now known as Feed'Em was raised by aunts and uncles following his parents' departure to the UK. Having been perceived to have been in unwittingly involved in a witchcraft ceremony as an infant, the subsequent years would see the young Lenga pass through various churches whose members had set out to "deliver" him before he himself would head to London to live out his teenage years. 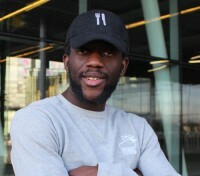 As well as developing an interest in hip-hop, Lenga started to be sucked into the harsh reality of London street life. But then Tracy was invited to participate in a NEET music course - designed to help young people who were not in education, employment or training. That in turn fuelled his desire to work in both performance and music management before impressively leading to a first class honours at the London College of Music. In 2015, Feed'Em released his debut mixtape 'You Can Know The Half' which, as well as acting as a platform for him to profess his newfound Christian faith, received BBC Radio airplay and a Jump Release Music Video Award nomination in the form of the song "GGATG". 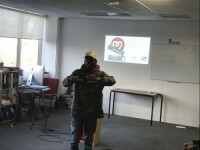 Receiving a Praisetek Gospel Music award for his services to the UK's independent music scene in 2017, the former Tracy Lenga began developing his Feed'Em Session and #FMGUK brands to help new talent rise to the surface via live gigs and monthly radio shows as well as making personal appearances at festivals such as Creation Fest and Bright Light Fest. Further showcasing his diverse nature and work ethic, Feed'Em now also works behind the scenes for British black gospel label Zoe Records whilst teaching music to teenagers as part of a gang prevention programme spearheaded by the Divine Purpose charity. With 2018 seeing the release of the uncompromising 'Murder The Flesh' EP, I caught up with Feed'Em to ask how his latest release - based around the Galatians-themed battle between the flesh and the spirit - came about. "That EP was a long time in the making," he admitted. "I'd been thinking about it constantly for a while and I'd been performing some of the songs that ended up on the EP at festivals. There was an expression in one of the songs that stuck with me about murdering the flesh and the need to die to myself to become more like Christ. That expression really stuck and that's how it became the title of the EP. When I started to develop ideas and concepts around that phrase, I began to come across Scriptures that talk about dying to our worldly passions and desires (Galatians 5:24) and the overall concept of the project began to make more sense." With a mock horror cartoon image of the artist wielding an axe to bring down his flailing doppelganger and a red blood moon adorning the EP's cover and the no-holds-barred delivery of Feed'Em's wordplay, 'Murder The Flesh' isn't for the fainthearted. "I think that's down to the artistic environment I'm in and the culture that I'm part of," he suggested. "In hip-hop, you have to be direct in your delivery in order to be heard - there can't be any ifs and buts when you're talking about the Gospel. With that approach, I understand that there are various platforms that won't accept it but I just try to be real to myself and bring the message to people - that's the most important thing." Some might argue that Feed'Em's own fusion of hip-hop and grime may be more readily accepted in the secular arena than in church circles. "Even within mainstream hip-hop, there are people who express their faith so people are already familiar with that approach," he advised. "In those songs, faith is discussed but it might not get any deeper than singing about blessings and common grace. What that does is open the door for people like myself to get deeper and tell them more about Jesus. I see it as a window of opportunity and I just try to tap into it and do the best I can." This direct approach extends back to 2015 with the mixtape release 'You Can Know The Half'. "That release was basically me saying that I'd been through a lot in life. Sometimes when you tell people your story, they'll say 'life is hard' and you reply 'ah, but you don't know the half of it'. I began thinking about that and I released that, if I kept that half to myself, then people wouldn't understand the amazing things God has done in my life. I wanted to really express my testimony and that's why it got that title. It was very much to tell my story and introduce myself to a Christian audience. I didn't even know there was such a thing as Christian hip-hop at the time. It was just me saying this is who I am right now and seeing how people would respond to that." From that album, the track "GGATG" - short for "God Gets All The Glory" - would go on to be nominated for a Jump Release Music Video award and receive airplay on BBC Radio. "It was definitely good to be on those platforms because it's hard to get there from the background I came from," Feed'Em explained. "There are lots of people who make Christian hip-hop music and it's not widely accepted on mainstream radio or in the wider world. I was super grateful to be on BBC Radio and it was good for me to see that people were actually appreciating the sound and the message." With a passion for Christ that comes across just as strong in our interview as it does when nestled amongst the hard-hitting beats and complex rhymes of his musical output, Feed'Em explained a bit about his faith journey. "When I was little, my parents moved from Congo to the UK and I was left to be raised by aunties and uncles. I was given some food to eat and what I'd eaten turned out to be part of some sort of initiation for becoming a witch. That meant that I then had to go through different churches to be delivered from this. I was about six or seven at this time and I didn't understand what was going on. People were praying for me and they wanted me to say a bunch of things that I didn't understand. It was a hard upbringing but it did allow me to experience church life from early on in my life. I was around people who were praying and fasting a lot and I became used to those things from a young age because of the whole deliverance process. When I became a teenager, I moved to the UK myself and that I meant I had to learn a whole new culture. The only thing that I saw was the street life and I chose to be a bad boy because I had no idea who I was at the time. Whatever identity seemed easy to adopt I just gravitated towards and, of course, I started to do all the naughty things that young people do in those situations." It seems that a personal tragedy would lead to the teenage Feed'Em accepting Jesus as Lord and Saviour. "My mother passed away and she used to pray for me," he recalled. "She showed me the Lord and gave me a lot of love. When she was gone from my life it was really a blow because I'd lost my identity again and I had to re-find myself. At that time, I started to think about Christianity more so I'd pray in my room each night before I went to sleep. Even though I was still doing lots of bad things, I was still praying and seeking God somehow. One night before trying to get to sleep, I prayed as normal but things became more amplified and I immediately became more spiritually aware. He told me I needed to confess my sins to him in order for him to save me. I confessed my sins and accepted him. That's how I gave my life to Christ and I've never looked back since." His conversion would have an impact on his musical choices in the short term. "When I was at school I was introduced to grime but, when I gave my life to Christ, I gave up on hip-hop because I didn't know how the two things could work together because of what a lot of the mainstream artists were rapping about in their songs. However, I wanted to reach out to my peers with my music and I ended up writing a very personal song for a friend whose dad had left him and he was really impacted by the song. After that, I got back into music and moved forward from there." One of the influencing factors in terms of Feed'Em finding his feet musically was a music course designed for young people who had fallen through the education or employment net. Said the rapper, "That NEET course really helped me see the bigger picture. As a young man, you only see the famous people in music and not the behind the scenes stuff. When I went on the course, I was able to see that music was more than just performance and that it was also a business. It was so inspiring and, even now, I'm working behind the scenes in music and have my own company plus I work for another record label. I love it and it's because of that NEET course. It basically opened my eyes and allowed me to see various areas within music that I didn't even know existed." Not content with achieving a first class honours at the London College of Music and developing his own career as a recording artist and performer, Feed'Em soon set his sights on helping others in the industry. "After I graduated from university, I knew how things worked in the secular music environment but I wasn't sure how they worked in Christian circles. I had learnt different business ethics at university and I wanted to invest in the Kingdom as an artist. That was the passion I had and I was looking for gaps in the market. I saw that a lot of artists lacked representatives and, because of that, they weren't getting paid on time or things weren't happening well for them so I thought that I could be the person who could support them in these matters." He continued, "Because I have a collective mind, I didn't want to claim the name Feed'Em for just myself. Instead, I wanted it to be a movement where everyone went out and communicated the Gospel. As a result, I had a few artists under the wing of Feed'Em Music Group and, through that, we started doing festivals and I was taking care of their bookings, promotions and such like. From that came the Feed'Em Sessions which is a radio show that promotes other artists. All of that allows me to see the whole scene as opposed to just part of it." Talk of the name Feed'Em led me to ask how the former Tracy Lenga came to be known by this title. "As I said earlier, sometimes expressions come to me and then there's a Scripture to back it up and it was the same with the name Feed'Em. When I was looking at the kind of hip-hop that was coming out via the mainstream, I realised that a lot of those guys were just feeding people negativity. I decided that I needed to feed people something substantial with the good news of Jesus Christ and that's why I chose the name. Reading through the Scriptures, I then discovered passages about the Word being the daily bread and man shall not live by bread alone and it all made sense." In order for the message to be communicated effectively, the quality of any Christian hip-hop artist's work must be at least as good if not better than his or her mainstream counterparts. "I try not to let being artistically valid blur my vision," Feed'Em said. "You can quite easily get it wrong by becoming more secular and no longer mentioning Jesus. There's only so much you can do in terms of reaching people. It's God that does the rest of the work and I just need to understand my part in the whole thing and do the best I can. Part of that is working on my craft and making sure I'm on par in terms of quality and delivery but not necessarily to copy a style that's out there in the mainstream at the moment. Trends come and go but the artists who are authentic and original will go a lot further. I know what the climate is like in the hip-hop scene and I know how to get more radio play but that is not the reason I'm doing things. I do my best to stay current and aware of what's happening on the scene but I must be authentically Christian in my delivery." Part of Feed'Em's drive for authenticity is reflected in his involvement with a gang prevention charity called Divine Purpose. "Teaming up with Divine Purpose has allowed us to get funds to use our music as a tool to teach young people about different aspects of life. Music is a way to relate to youngsters because a lot of young people are interested in writing and performing so we use that as a means of connecting with them. It's not necessarily a Christian project where we're actively preaching the Gospel but it is community-based and it allows us to shine the light of life on them and then point them in the direction of where they can get help if they need it." Continued Feed'Em, "We also have a youth club in the local community to help us get kids off the streets. It can get crazy in the area we're in so that's what that project is about. We've been able to go into schools and clubs through different projects that we've partnered with. The interaction is incredible and you learn so much about these people when you make yourself available to them. It's about helping them navigate through life and mentoring them - something I really enjoy and I'm hoping to do more of this coming year." I suggested the idea of a rapper - especially a Christian one - performing in a school setting might a first seem strange to those on the receiving end. "It's kind of weird at the beginning because they don't get it at first," admitted Feed'Em. "It's like 'he's rapping but he's not swearing' but then they really get down with it. At the end of the day, it's not negative and they can play our music to their parents freely without having to worry about any bad words. We get a very positive reaction - even from the teachers!" In closing, I asked Feed'Em what advice he gives to young people starting out in the music business. "I urge them to be sure of what they're doing because it takes a lot of commitment. There's no point in committing to something that you don't like or isn't really part of who you are. I encourage them to make their foundation solid and find what it is that is really their thing. That's when we can encourage people and show them how to go about achieving their goal." Lins Honeyman is a Perthshire-based singer/songwriter and currently presents The Gospel Blues Train on Cross Rhythms Radio on Saturday nights from 11pm and on Listen Again. Gospel grime artist Feed'Em releases single "That's Where I Be At"